The Trump administration recently released its full federal budget proposal, which could slash funding for the DOE Office of Energy Efficiency and Renewable Energy (EERE) and related offices and programs. EERE has been at the forefront of supporting successful public-private partnerships and innovative, clean energy entrepreneurs. Funding that nurtures new businesses without requiring their owners to give up any stake in their companies can be make-or-break for the early-stage startups that drive innovation. When government, well-positioned to make this kind of unique investment, puts forth taxpayer dollars, it encourages the private sector to buy-in as well—often with a multiplying effect. DOE has created crucial opportunities nationwide that reduce risks for both entrepreneurs and investors, two examples being the National Incubator Initiative for Clean Energy (NIICE) and the Advanced Research Projects Agency-Energy (ARPA-E). Dulling the cutting edge of our nation’s innovation enterprise curtails our ability to strategically lead in scientific and technological innovations in energy and across other sectors. Decelerating cleantech research, development, demonstration, and deployment would also inhibit our ability to deal responsibly with climate change and its consequences. Specifically, the President’s plan for DOE cuts FY18 funding to EERE by over $1.4 billion, down nearly 70 percent from FY16 and FY17 levels, and it lines up the $290 million ARPA-E program for elimination with an initial 93 percent reduction for FY18. These offices, programs, and labs have proven results, and to end or scale them back to virtually nothing would be a disservice to U.S. industrial competitiveness and the American people. The administration’s harsh anti-clean energy rhetoric and its deep cutting budget proposal are signs that our Energy Department may very well lose its special and influential role at home and abroad in driving innovation. At a time when President Trump is taking the U.S. out of the Paris Climate Agreement and federal clean energy technology investments are critically and urgently needed, his budget broadly threatens our country’s booming cleantech economy and throws a wrench into our nation’s efforts to cut carbon emissions. The good news is that clean energy continues to receive bipartisan support, and the proposed DOE cuts are widely opposed, including by at least six Republican senators and a bipartisan group of seven former EERE assistant secretaries. As stated in their letters, these leaders also recognize that our federal government has a vital role in public and private sector investments and collaboration. 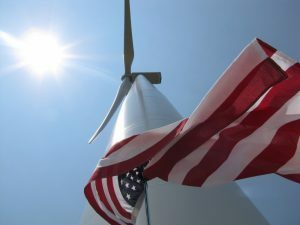 With local and state governments, businesses and investors, and numerous other nations stepping up to make significant cleantech commitments around the globe, now is not the time for the federal government to back down from leading the charge, abandon our history of American innovation, and jeopardize a brighter future powered by clean energy. 1. How will the changes in appropriations impact energy programs and innovation? 2. Can state mandates like California’s for grid energy storage help motivate private sector investment into innovative research if federal funds ultimately dry up? 3. Has private sector financing for clean energy technology and innovation reached an inflection point where taxpayer funding is no longer, or far less, necessary? Thanks to the high-capital intensity, long-term time horizons, regulatory uncertainty and technical risk, there will be a significant role for the federal government to play in developing advanced energy technologies for the foreseeable future. Contrary to the thinking that has served as the foundation for the proposed cuts, the private sector does not have sufficient incentive to invest in the much of the research being done at DOE. That’s in part due to the the spillover effect, i.e., public benefits such as enhanced energy security, reliability, environmental and climate performance. The fact is that public research investments “crowd in” private sector funding, by de-risking technologies at key phases in the development cycle. As far as the impact of appropriations themselves, its premature at this point to suggest these cuts will be realized. As the recent omnibus negotiations proved, there is significant congressional support for energy R&D. But even if funding levels remain relatively flat, it hurts our competitiveness in (at least) two critical ways. 1. It injects uncertainty into project planning and jeopardizes human capital critical to our long term innovation capacity. 2. It increases the odds that we fall further behind other nations who are increasing their own commitments to energy innovation, including through the Mission Innovation initiative. Of course as a whole, the U.S. still spends far more than any other country, and has a host of advantages (as of now) that will make it hard for the U.S. to “lose” in the traditional sense. But Asian competitors don’t need to surpass the entire U.S. innovation ecosystem to continue dominating lithium ion battery markets — a technology invented in the U.S., by the way. As we look for ways to reinvigorate our economy, the track record of investments in energy innovation are among the best bets we have. Cuts such as those proposed would have serious long-term consequences for our innovation capacity and economic vitality. As you noted there are definitely many important public benefits to federal funding in these areas and certainly many reasons to support long term innovation capacity and American economic competitiveness. Regarding the 3rd question about whether private financing is alleviating the need for public financing, the answer is no. While clean energy is now cost competitive with dirty energy and is on a strong growth curve, the question is not whether clean energy can stand on its own, but rather are we scaling up clean energy and scaling back dirty energy fast enough. The answer to that is that it is not even close. If every nation followed the Paris Accord and met their self-determined targets, the world would still warm +3.7ºC (and probably more) by the end of the century, which would be catastrophic to civilization. In fact, the only still valid IPCC scenarios that keep us under +2ºC warming (a universally accepted goal) all require emissions to drop to zero around 2050 and require about 10GT-CO2 of negative emissions thereafter! A good reminder in your initial comment here, Dan, that the bigger picture goal is crucial and that the context at that the scale of the problems and of the impacts of potential solutions must be seriously considered in answering these questions. An all-of-the-above financing strategy appears crucial to make significant progress. Thanks for linking to that David Roberts piece–a sobering reminder of the “daunting” math, overall lack of political will, and problems with cognitive dissonance. I oppose subsidization of sources of energy on the grounds that currently available climate models supply a regulatory agency with no information. Absent information, a regulatory agency cannot regulate. Today’s climate models do not make predictions. Instead, they make projections and though projections are often confused with predictions the meanings of the two terms differ. In particular predictions supply a regulatory agency with information about the outcomes of events but projections supply no information. Absent information, a regulatory agency is physically incapable of regulating Earth’s climate system. The waters surrounding the issue of subsidization of energy sources that are claimed by their proponents to reduce the global warming are muddied through application by pro-subsidization forces of the equivocation fallacy. For further information on this issue see the peer-reviewed article at http://wmbriggs.com/post/7923/ . Climate scientists have given us much actionable information, including letting us know we need to reduce greenhouse gas emissions to zero by around 2050 and then have negative emissions after that. Policymakers would be wise to listen to climate scientists. Thank you for taking the time to reply. You’ve made a number of assertions but have proven none of them. To prove an assertion you’d have to compose a syllogism and prove that both of its premises were true. In discussing the global warming models we labor under the handicap that the term “model” is polysemic, that is, it has more then one meaning. Often this word changes meaning in the midst of a global warming argument. If it changes meaning, the associated argument is not a syllogism but rather is an equivocation. To draw a conclusion from an equivocation is to apply the “equivocation fallacy” and is logically improper. A workaround has been developed for this phenomenon under which a distinction is made between a “prediction” and a “projection.” Currently no global warming model makes “predictions.” All of them make “projections.” A model that makes “predictions” assigns numerical values to conditional probabilities. For assignment of these values a statistical population is required but there is no such population. Thus, a model that makes “predictions” cannot be constructed. For the time being we are stuck with models that make “projections” but a model of this description provides a regulatory agency with no information. This conclusion follows from the definition in the language of information theory of “information.” Without information a regulatory agency cannot regulate. Terry: You still are not making any sense, but I will not reply further as you are off-topic and appear to be trolling. In your reply I note that you change the topic from global warming policy to me. This makes of your argument an example of an ad hominem argument. As you must know, an ad hominem argument is illogical. It would be more profitable to those who are taking the time to audit our debate if you were to confine your arguments to ones that are logical.